The other day Instagram rolled out an activity dashboard feature which basically let users know how long they’ve spent on the platform. 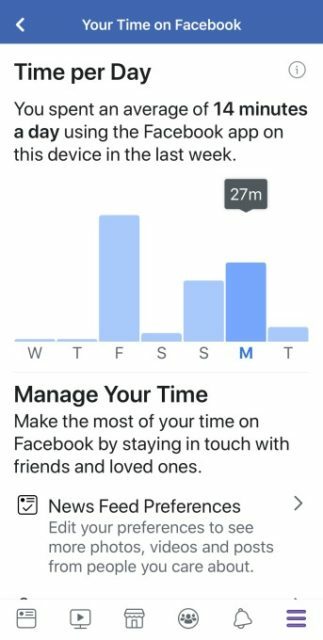 Now it looks like Instagram’s parent company, Facebook, is rolling out a similar feature called “Your time on Facebook” to its platform where for the most part it does the same thing. In fact it actually kind of looks the same, according to a screenshot shared by TechCrunch. It shows users a bar graph in which it tells them how long they’ve spent on the app per day during the week. It also averages out the time that they’ve spent, and also gives users the ability to manage their news feed in an attempt to help reduce the amount of time they spend on the app. Granted users spending more time on Facebook is a good thing, but companies have been criticized in the past for making their products too addictive, and studies have shown that too much time on social media can actually make you feel lonely. This Facebook feature isn’t exactly new either as it was initially spotted in development back in June, but it looks like it is finally available to all users. Facebook is also not alone in introducing such features. Apple has also introduced a similar feature on iOS, and more recently Google has started pushing it outs digital wellbeing tools onto Pixel and Android One devices. Filed in General. Read more about Facebook and Health.